Our user-friendly R&S®Online Service Management ensures that you have complete control of your Rohde & Schwarz test equipment at all times. This simple management system contains your current service cases, complete service history and all documents for your instruments. R&S®Online Service Management is there when you want to get instruments calibrated or order other services. You can place orders from anywhere, at any time, quickly and easily. R&S®Online Service Management gives you secure access to all service-related data, 24-7. 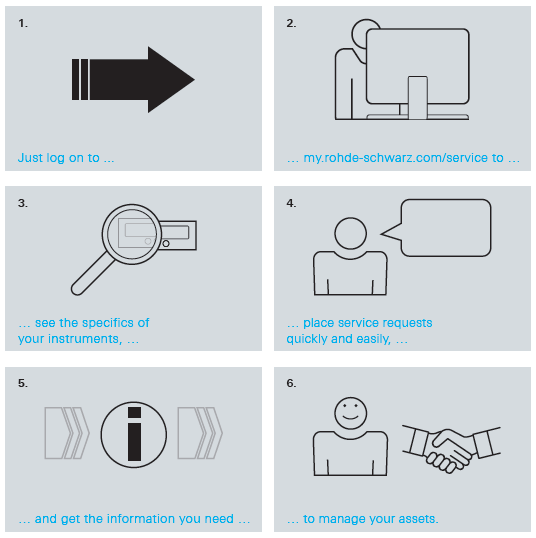 Just log on to the password-protected space at my.rohde-schwarz.com/service to conveniently manage your service requests and calibration schedule, wherever you are. Added value: Rohde & Schwarz encryption meets the highest standards. We make sure that you, and only you, can access your data. To make sure that you have more time for your core business, we put all your instrument data together in one place for an easy overview. It shows you all the documentation and configuration data for your instruments, as well as the status of repairs and calibrations. At a glance, you can track service cases, make new requests and see active and inactive warranties. Added value: R&S®Online Service Management also allows you to manage other manufacturers’ instruments that we service. Calibration documents and lists can be exported in standard formats. A good management system should make even complex things easier. The R&S®Online Service Management helps you organize your service cases, making previous, current and scheduled calibrations easy to enter and manage. The easy operation and clear navigation save you time as well as unnecessary paperwork. Added value: R&S®Online Service Management can also be set up to alert you to upcoming calibration dates.